What are your thoughts on taking the Blizzard Cup championship? I felt strange when I was losing 0:2. Those games weren't mine to lose, and I became mentally shaky after I made odd engagements and lost. But afterwards, I was able to regain my mental composure and focus on the match in order to win. I do feel good about taking the championship, but I feel slightly bad about beating a teammate to do it. But still, I'm happy. How did you feel when you lost two times in a row at the beginning? In the first set, I couldn't focus and lost my Infestors, which cost me the game. In the second set, I also fought from a strange location and lost. But afterwards, as I said, I focused on the match, and I feel great that I was able to make a comeback victory. You blocked two out of three of PartinG's Immortal pushes. What was your key? I played on ladder during the morning; it is difficult to fight against Immortals, but I managed to block them using Infestors. Around when did you feel that the victory was yours? I felt that I had won when I blocked the attack coming from my opponent during the sixth set. What do you think of the Heart of the Swarm Invitational? I think that Zerg looked strong because DongRaeGu is an incredibly good player. I feel that the balance is about right, and I also think that there are some things to be changed for the future. You took down your senior teammate. Did anything interesting happen as you were preparing for the match? How did you practice? I played mind games with PartinG-hyung by saying on Twitter that it was impossible for me to beat him. I barely practiced, and what practice I did do was mainly through ladder. I understand that PartinG-hyung prepared the same way. 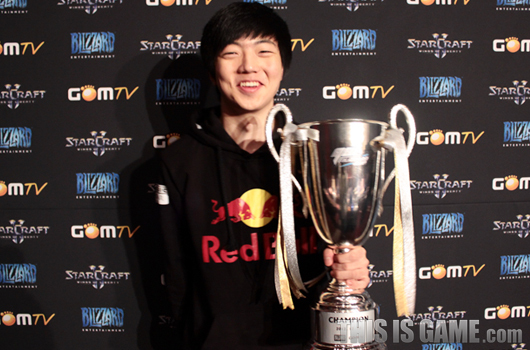 With your Blizzard Cup victory, you were given a 2012 GSL Tour Player of the Year Award. Wings of Liberty is almost at an end, so I'm incredibly glad that I was picked as the Player of the Year for 2012. It's a glory to have as a pro gamer. What results do you want to achieve in 2013? Do you have any tournaments or awards that you want to take in particular? Next year, Heart of the Swarm is coming out, and I want to win a lot of tournaments and become recognized as a Zerg player, like Mvp [is as a Terran player]. How are you planning to use your prize money? All of the prize money gets deposited in my parents' bank account, and my parents give it to me bit by bit for me to spend. I think I'll be making use of it in the future, after I amass a good amount. Please tell us anything more that you have to say. I'm very glad that I was able to win the final tournament of the year, and I will work hard to show good form in the future. I'm thankful to my manager, coaches, and teammates for always giving me help, and I'm also grateful to my family. I want to send my thanks to my team's sponsors, Red Bull, Zowie Gear, and Joy Gear. Happy for Life =) sad for Parting ;; bitter sweet indeed. Thanks for the translation wozzot! Life wants to be the next Mvp huh? Alright, make it happen kid. We'll be watching. Finally things are starting to get interesting again. gogogogo life! woo =) very happy for him and a well deserved win! Has seeker seriously been banned? Haha. Sorry for the ignorance. Anyway, extremely happy that Life won. Hope he wins even more championships. Was curious so checked out banlist. Really insensitive. grats to the young one. Btw, there should be a runner up interview too! Congratulations to Life!!! It is bittersweet to win with a team kill. I'm a little down that it's not a Parting interview. I would have wanted one more to get me through to the New Year. His interviews are so awesome.